NYC is home to various Flagship stores, due to the prominent location of manhattan and the large influx of visitors from around the world. In my opinion flagships have a superior level of design when it comes to their interior and even exterior. My roommate had recently landed a design job for Tory Burch, and was looking to get her Mom one of the bags at the Flagship store for her birthday. I had purchased the Fleming Convertible Shoulder Bag in black, and wanted to showcase it outside the flagship. At the price point of $438.00 you would think that the quality would be exponential. Wrong! After a few days of using this bag, and minor scratching on the subway the black coloring was coming off quickly. The bag isn’t your typical leather, it is more so coated along all of the quilting. Possibly spraying this with something could have prevented the material from rubbing off? Either way a disappointment! From the first step in, the Tory Burch Flagship feels like a home. The decor consists of beautiful gold accents on each fixture, candles burning, and homey furniture. You feel at home sitting down and trying on a pair of shoes, or looking over into one of the mirrors. Going onto Coach’s flagship, I was instantly amazed by the giant Rexy made out of various leather bags, backpacks, satchels, etc. Stuart Vevers has been Coach’s Executive Creative Director since June of 2013. He has really helped turn the brand around from the C pattern allover. You will find other animals throughout Coach made intricitaley out of leather products, this is something that Stuart brought on. Saving the best for last, I absolutely love the Kate Spade Flagship. Well, I love Kate Spade everything. This Flagship is filled with Kate Spade trinkets, striped wallpaper, cute furniture, and do I need to say more? I’m sure you envision it. The store is enormous with multiple levels, and even a bridal section. Upstairs a great photo-op is by the french doors that lead out to a little patio area. These are all places that you need to make a day out of and visit yourself! 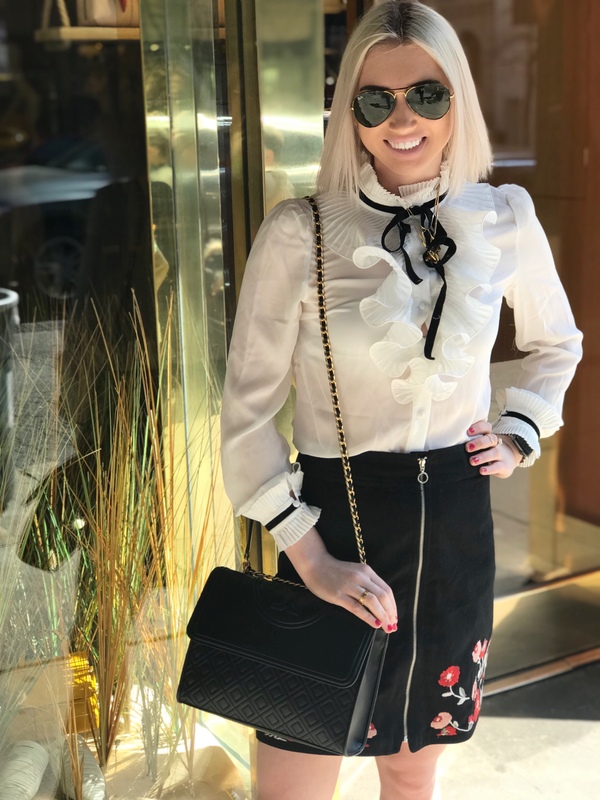 My Look: Top is a preppy Gossip Girl/ Tinsley Mortimer inspired look from Shein. My skirt is from Loft OUTLET, bag is Tory of course, and necklaces are from Jet Set Candy.